Gadget battery that is charged using solar thermal power may have often seen. But what about alternative energy that relies on human breath? If you are interested to play a role in minimizing global warming, Aire can help you realize that. 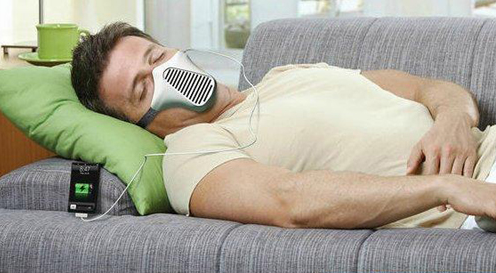 Aire mask is a concept that comes from Joao Paulo Lammogli. He convert the power of breath and then convert it into electricity through a small wind turbine. All you need to do is just make sure that the Aire mask still connected to iPhone and then breathe normally, and you will get sufficient power to charge your iPhone battery. It could be interesting if Aire really can be made. We can use countless of breath throughout the night to charge the iPhone. But is it possible?